There was the rumors going on for the new design of micro-blogging site Twitter, and the company finally announced the new clean and transparent look of twitter. Today company unveiled a new home page which will have all the content feeds, and this is specially for those users who had not logged in form long time or didn't have account, but still want to know what’s happening. From the start, you’ll see a list of topics such as Pop Artists, Tech Blogs & Reporters, ‘Cute Animals (of course) and others. Users can click any of the topic from the above list and get all the real-time updates without log into the accounts. The homepage gets the screensaver background features with the login and sign up box aside it. Currently the new designed to twitter is rolled out only in U.S, but company mention that it will soon available for worldwide as it continues to test this. 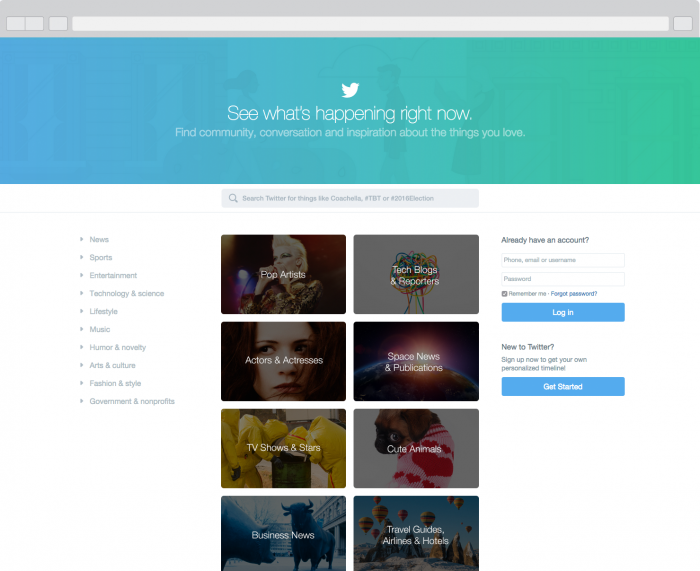 Company wants Twitter’s front page to be informative, entertaining and relevant to everyone.